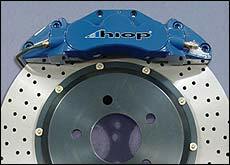 hiop aluminium six piston callipers with offset cylinders, a slim compact design with a large piston area. This results in a light compact calliper with superior clamping force, low drag and easy pad change. Pads are selected for their high friction coefficient and high resistance to fading. Stainless steel braided hydraulic hoses are used for added safety and anti dilation under heavy braking. The hiop brake kit comprising the above, gives your vehicle superior braking, a sporty look, reduced unsprung weight for low wear and tear on your suspension parts and improved handling.